Between the City and the County, you will have less money next year, a pattern that will repeat each year thereafter. So, why vote to have even more taken out of your pocket, no matter how small? You can say NO byvoting against these three bond packages in November. As the City works to sell the three bond packages totaling $74 million to the public, Council members got underway giving their own financial interpretation of how the bonds would impact property taxes. In another article, Cecil speaks of it just being $20 a month ($240/year) but what Cecil fails to mention is that between the County and the City, taxpayers will actually be out twice that ($540) and up. "One thing that is not clear is how much the borrowing would raise property taxes." The City's website on the bond referendum already states that there would be at minimum a 4.15 cent per $100 of valuation increase in property taxes. It is very clear both the City Leaders and our local Media are playing a word game with residents. They assume you're dumb and dumb on many levels in order to sell these bonds to you. The last valuation was in 2013, just as we had come out of the recession. We are due for another one in 2017. You can imagine the kinds of percentage increases we will see next year when property is revalued. The last time it ranged from 10% to 26% increases, depending on where you lived but those in and near the City figure higher. In some weird cases, property went down but on average - they increased. In addition, the Buncombe Co tax rate is .60. This could also increase as it did after the 2013 County valuation. After the 2013 revaluation, the Buncombe Co tax rate went from .5250 to the current rate of .60, as was recommended by County Manager, Wanda Greene who recommended a 15% increase plus a levy to pay for programs. This the same Wanda Greene who recently was in the news for giving herself a major raise. Based on this, City property owners will be paying more both because of an increase in their property values by Buncombe County as well as this property tax increase by the City for these bonds. This is less out of your pocket, for your family. All City Services have gone up and likely to keep going up year after year. Have you taken a look at your latest water bill, i.e., the new mortgage bill? Just this past July, the City increased water rate by 1.5%. In 2015, your water rate was increased. It increased the trash collection rate by $3.50/month ($10.50 - $14). In 2015, it had increased $3.50 (from $7 - $10.50). It increased the stormwater fee by 5%. Your stormwater fee has increased in 2015 and 2014. It increased the motor vehicle fee by $30. In addition, just this past July, sewer services went up 2.5% , an increase for the 18th YEAR IN A ROW. Do you think that is going to change? Probably not. While it is necessary to pay for City Services, the cost of these keep going up and you have little control over that. YOU DO HAVE CONTROL OVER THE PROPERTY TAX RATE INCREASE FOR THESE BONDS. You have limited control over the Buncombe Co revaluation (yes, you can appeal but all the same, it's probably gonna go up). You have very limited control over the city service rates. BUT YOU CAN VOTE NO AGAINST THESE BONDS AND SAVE YOURSELF AT LEAST ANOTHER 4 CENT INCREASE. The City thinks residents are too dumb to figure this out. The City is trying to shuffle off these increases in property taxes and services by constantly talking about how little it is to you. What they really mean is this: yes, more money will come out of your pocket but you can only blame a small portion of it on us. That is to be disputed. We see a minimum of $500 increase on the average price of a home in Asheville but do you as a taxpayer really care? At the end of the day, that is less out of your family's income. You do have control over a part of this increase in YOUR expenses by simply VOTING NO IN NOVEMBER. Needless to say, our City and County property taxes are going to increase - values do go up and the City can and will plan for future tax rate increases. They increased the property tax rate in 2013 by 4 cents and again in 2015 by 1.5 cent. It is highly likely, that even after these bonds pass, your property tax rate will increase again within the next two years. So, while Mr. Cecil, and other Council members say it's no big deal, he should let retirees and most of the hardworking Asheville residents and business owners, decide for themselves. you, the taxpayer in the City of Asheville, are going to be the co-signor of this $74 million debt if voters approve it in November? YEP - YOU, THE TAXPAYER are RESPONSIBLE. Not the City. The City doesn't lose a thing. These bonds are not backed by City Assets like property or buildings. 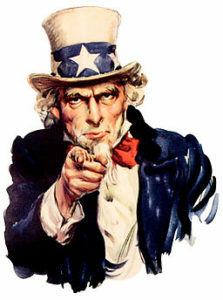 You, the taxpayer, are held responsible. In short, you are the co-signor of this bond debt. If the City can't pay, the banks come to YOU by way of your property taxes. 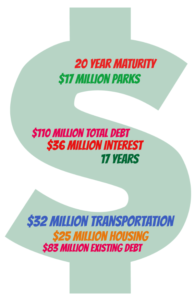 All of these general obligation bonds ($74 million total) are backed by property taxes of the City of Asheville property owners. This is because these are non-revenue bonds, meaning they are not backed by a revenue generating project. Sidewalks, greenways, parks and loans to private developers do not generate revenue. They are not backed by City assets either like buildings or City owned property. The collateral for these bonds, the promise that the banking institutions and investors that buy these bonds, is that they get paid back via property taxes. They get paid back in this case by YOU, the taxpayer, by increasing your property tax rate and ensuring those monies go to the City to pay it's annual debt service. BUT, WHAT IF, we experience another recession? As a business person and for your own family, you probably plan for the worst. What is the worst that can happen if these bonds pass? The City defaults. That's right. Your property taxes can then be jacked up enough to pay for the debt service. And, if you can't pay your own property taxes then what happens? Your property taxes get added to your mortgage and if you can't pay your mortgage, you lose your home. Essentially, the collateral for these bonds are the value of your property and investors assume that the value will only go up and that you can afford to continue paying for those increased property taxes. It's also entrusting the City to pay the debt service. You don't think this will happen? Maybe not, but we didn't expect that recession either. Each City taxpayer should consider this carefully just as you would if you were going to co-sign someone's car loan. Just pay attention to the details and ask yourself if you're okay with it. Get ready, the $74 million bond package WILL BE on the November ballot. We spoke to the assistant bond counsel at the State Treasurer's office who reviews these bond applications and they confirmed that next Tuesday, October 4th, the committee that reviews bond applications will be reviewing Asheville's applications along with 3 others across the state. The bond counsel also confirmed that they would be approving the application. So, next step: November Voting. How Long Will We Be Paying? Now this is a tricky question which the City has not clarified and our local media can't seem to either but we made a simple call to the LGC (NC State Treasurer's Office) who confirmed these details - it's public and all you have to do is ask. (NOTE: we also confirmed that they have received very few calls about this). The City has 17 years to issue these bonds. Really? Yes, according to statutory rules, they have 10 years to issue but can file for a 7 year extension which means 17 years. These bonds are long term meaning, they have a 20 year maturity during which the City must pay at least $1 million in principal each year, plus interest but we will have to pay more cause you can't pay off $110 million by only paying $1 million a year for 20 years. The interest the City pays on these bonds will be a little less than 3% and the total amount of interest will be around $36 million. Total debt will be $110 Million. If the bonds were issued all at once, the City would have to essentially pay $5.5 million per year. Keep in mind, the City already has existing debt of $83 million. So, our new total debt would be almost $200 million. Just because Voters approve the bonds (if they do and we hope you won't) in November, the City will then have to certify the vote plus a bunch of other paperwork. According to the representative at the LGC, the earliest they could sell these to investors would probably be early January 2017. They are sold by electronic bid process in which banking institutions and investors submit their bids and purchase our bonds online. This usually happens on a Tuesday around 11am. The City can also just issue a portion of each bond package. For example, $10 million from transportation, $10 million from affordable housing and $5 million from parks & rec. The City does not have to issue all the bonds for sale at once. It has 10 years plus 7 year extension to sell these bonds. Therefore, some of this debt could be issued in 17 years and with a 20 year maturity, we would be paying on these until 2054. Is that likely? Hard to tell what this Council will do. Though they've been specific about where they "plan" on putting the money, they have been vague as to when they plan on issuing these bonds. All next year? Scattered for the next 10? Let's see if they tell. In North Carolina, municipalities do not have to get voter approval to issue general obligation bonds. In fact, this year the City of Asheville issued $42 Million in bonds as part of it's massive Capital Improvement Plan begun in 2012 (the advent of New Belgium). So, why didn't the City just issue these bonds without voter approval? Probably because they would be voted out if they did. Instead, they put it on you. Asheville Per Capita Debt will only be $103 less than Charlotte, which is in 4th place and $400 less than Raleigh which is #1 in Per Capita Debt. None of the above information has been reported by our local media. In fact, they write ad nauseum about where the money will go when really there is no guarantee or requirement by the City to stick to its stated plans as to which projects the money will be allocated. We did write that very little of it appears to be planned for South Asheville taxpayers who contribute a huge portion in taxes to City coffers. But who knows, maybe they'll change their mind. Click here to read: Does anyone really know where the bond money will go? On August 2, 2016, the City of Asheville Blog published an article about upcoming public hearings on the $74 million bond referendum. That is required by law. Also, by law, it is not supposed to spend public funds promoting the bonds (which is why the Chamber is doing it for them). It should be information only. In other words... don't worry about it. We're not the only ones with skyrocketing debt per person. Really? We did some checking. To most people, "many" means countless, scores of or a lot of... To the City of Asheville, "many" means 4 more. PS> If you want to find the original blog by the City mentioning the total Per Capita Debt incurred by these bonds, you will have to click here because the City has buried that blog post under the tag "Newsletter". 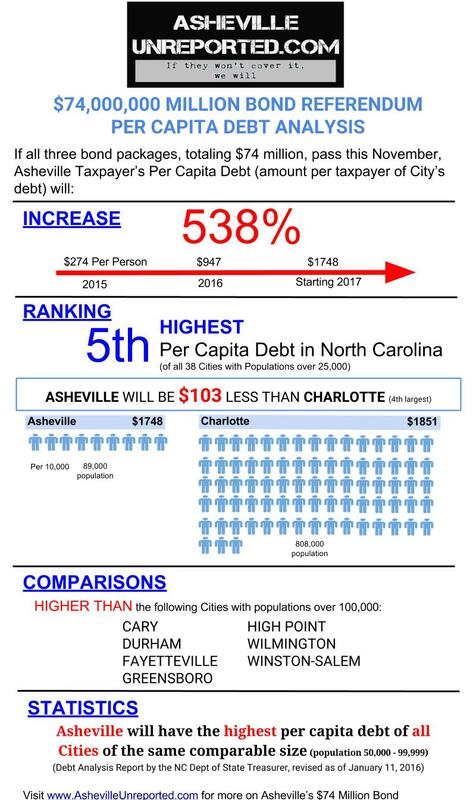 According to the NC Dept of State Treasurer's Debt Analysis Report for the period ending June 30, 2015 and revised January 11, 2016, it shows very clearly that Asheville will have the 5th highest level of Per Capita Debt of all NC cities over 25,000 in population if these bonds pass. Further analysis shows that we will only be $100 less than Charlotte which is in 4th place and only $400 less than Raleigh which is in 1st place. The City's own blog reports that Asheville's Per Capita Debt was $274 as of June 30, 2015. In one year (June 2016), that had increased to $947. If these bonds pass, the City reports our new Per Capita Debt for 2017 to be $1,748 per person. That's a massive increase of 538% in less than two years. In addition, we will have another #1 ranking (not so great) of being the highest Per Capital Debt of all cities of our size (50,000 to 99,999). The current high is $1,188 for our population size according to the same Debt Analysis Report by the NC State Treasurer. Why does Per Capita Debt matter to taxpayers? Because these bonds are NOT being used on projects that are revenue generating, they must be paid through Taxation which means an increase in Property Taxes. The City has said that property taxes would have to go up by 4.15 cents to cover these bonds and then in the same mouthful says this is nothing. Our analysis shows, it will go up much more than that. We'll be writing about that in our next article. Property taxes will go up dramatically and these taxes will simply be passed down to renters or will continue to push out retirees that can't afford dramatic changes to fixed incomes. It will also continue creating Asheville as an elitist town where only the wealthy can afford to be here. Seems hypocritical when our leaders talk about caring for millennials and affordable housing. More on this in our next article. Asheville already ranks as one of the most expensive places to live in North Carolina. Our cost of living index is higher than the national average and higher than many of the cities in North Carolina. (Although the Chamber reports that we are below the national average). (It depends on the source and it appears the Chamber's source is the only one stating that we're not above the national average.) What does that mean? Not only housing is expensive but Healthcare, Utilities and even Groceries cost more here than the national average. With an increase in property taxes and rents, that cost of living goes up even further. Approximately 40% of homes are occupied by renters (42.7%) (Source: US Census). Of those renters, 36.5% of their rent makes up at least 35% of their household income. A single person making $2166 per month (the average per capita income), spends at least 800 on rent. Some will tell you that those figures are even higher today as these figures from the US Census are as of 2014. The increase in property taxes will mean an increase in rents in an area already struggling with "affordable" housing. It assumes no other property tax increase for other debt in the next 10 years. This also assumes no other City debt is added to this debt. Why are these bad assumptions? The last property tax increase was in last years budget (2015-2016) of 1.5 cents to raise 1.5 Million. The City promised no increase in property taxes in this year's budget but then recommended this $74 million bond referendum one week after the budget passed. Hmmm... Now we need to raise $110 Million... you can't do that with just a 4 cent increase. We are due for a revaluation of Buncombe County property which means all property values will likely go up. Property owners will get new bills starting in 2018, not that far off. If the City loses the water system, there will be a negative impact to the City's revenue. Where will these funds come from then? While these bonds sound like a good thing, are they really? For all the talk by our leaders of needing good paying jobs and affordable housing, their actions are hypocritical. Ever heard the saying, "Actions speak louder than words."? The City has indebted it's taxpayers for greenways, $20 million of taxpayer funds to fix 2.2 miles of road for New Belgium trucks in the River Arts District and bike lanes for the 1% that it has run out of funds to maintain its streets, sidewalks, public transportation, and parks. And, while the City and the Chamber talk endlessly about affordable housing, half of the $32 million of the bond dedicated to affordable housing is earmarked for PRIVATE DEVELOPERS and the other half to the City to buy up land. These bonds are hypocrisy in action. Eeny Meeny Miny Moe.. Where will the bond money go? NO ONE knows. Not even the City of Asheville. "when we write the bond question, the question is written in such a way that it leaves the option open for Council to add or remove particular projects." "..it's important we stick to that plan." Mayor Manheimer, knowing all eyes are on them, did warn "....there are expectations from the community..... Because we do have community trust that we will spend the money on what we say we will spend the money on, it's important that we stick to that plan." However, she also warned.... "There are other big ticket items not in this bond that will need some creative planning." Hmmmm. Whenever politicians talk about "creative planning" and money in the same sentence, you know it's going to be shady. This is the problem with bond money. How money can be allocated CAN BE changed. The only known are the three broad categories under which the bonds must be spent and they are Transportation, Parks & Rec, and Affordable Housing. The grand total of the three bonds is $74 MILLION. These three bonds are much like a sidewalk Shell Game. You think the money is in one place, when it's been moved to another. The City Council can change their mind as long as the funds go in the same category. Therefore, what they sell you, is not necessarily what will be. Take for example, the $32 million designated for Transportation. The City has said they will spend at least $16 million on streets and bike lane repaving but the City could move these funds to more Greenway construction instead because Greenways also falls under Transportation. See how easy that was? The City of Asheville has done their media best to sell these three bonds by specifying the projects they feel would appeal to voters the most but in truth, the City of Asheville does not have to specify or guarantee in any WAY, SHAPE OR FORM, that the funds will go to those specific projects. Even so, The Citizen-Times and Mountain Xpress have recently written extensive articles describing which projects, which roads, and which parks the bonds will be spent on. At least there will be a paper trail to keep City leaders accountable but who cares about that? At least we can do a whole lot of screaming and crying after the fact, if that is any consolation. IMPORTANT: The City is busy decimating the trees along the French Broad River as we publish this article. Say goodbye to your lovely 100 year old trees before it's too late (like Monday). Read this article to learn why not having a Master Street Tree Plan is ruining your French Broad and scroll to the bottom to see the video coverage. The city’ Master Street Tree Plan is supposed to regulate cutting. Problem is, it doesn’t exist. And here come the greenways. In the late 1970’s the Asheville Chamber of Commerce launched a promotion centered around the slogan “Cool, Green Asheville.” Posters, billboards, buttons and bumper stickers, all saying “Cool, Green Asheville” in relaxing shades of green and blue, blossomed region-wide, touting Asheville as a getaway haven, an oasis of peace, quiet and natural beauty in the frantic desert of the daily national grind. The Tree City USA program was begun in 1976 by the Arbor Day Foundation as a means of encouraging cities across the country to plant more trees and to protect the trees they already possessed. There are now more than 3,400 Tree City USA municipalities across America, including 85 in North Carolina, only two of which – Farmville and Wake Forest – have been members longer than Asheville. Well, Asheville certainly celebrates Arbor Day, mainly under the auspices of the nonprofit Asheville GreenWorks. A full day of activities is already scheduled for next April, including a proclamation from the mayor, a tree circus, and tree climbing demonstrations. So, check. Asheville has a Tree Commission. Check. Whether the city spends $166,000 a year ($2 a head times a population of 83,000) on “urban forestry” is probably difficult to compute, so, question mark. But the ordinance itself is not there, as some concerned citizens discovered when they tried to get the city to tread more carefully, especially with regard to cutting down trees, in creating its much-heralded greenway system. “I have found the same to be true. The City of Asheville does not have a Master Street Tree Plan,” Farmer replied. Asheville Tourism PerspectiveProponents say the greenway, part of a nascent network of greenways surrounding the city, would be a jewel in Asheville’s crown, affording superb hiking and bicycling as well as spectacular views of downtown. But conservationists say it would ravage the hillside forest, scar the landscape, and obliterate irreplaceable old-growth trees. Property owners in the area (both in the path and down the slope) fear its proposed ten-foot asphalt roadbed would cause catastrophic stormwater runoff, resulting in mudslides and flooding, and would also wreck neighborhood privacy. And critics of city government see it as yet another example of reckless disregard for the consequences of pushing through a pet project. Spoon and Bakale-Wise in February started circulating a petition headed “Save Beaucatcher Mountain.” The petition stated, “For eight months community members have suggested viable options that accomplish the same [greenway construction] goals faster, cheaper, with less environmental damage, and with community support instead of opposition,” But, it continues, “Asheville Parks refuses to conduct any environmental impact assessment by qualified professionals. Responding to Spoon, Farmer said, “There have been 34 projects since 2011 that were executed by either Public Works or Capital Projects that may have involved tree removal.” Farmer told Spoon on August 16 that complying with Spoon’s August 16 request could take as long as six [additional] weeks and could involve compiling more than 10 gigabytes of data. Meanwhile tree removal continues apace at the site of the emerging French Broad Greenway, along 2.2 miles of riverfront between Carrier Park on the soth and the Hominy Creek Greenway on the north. That greenway embraces the city’s River Arts District, where the city is using its powers of eminent domain to take over more than 30 private properties. The city has brushed aside concerns about cutting mature trees and their root systems, which some say will dangerously destabilize the river’s banks in that flood-prone area. Property owners in that area visited the Asheville Tree Commission who told them they had nothing to do with City Projects. To read that article, click here. AU reached out to city Greenways Coordinator Lucy Crown for an update on the Beaucatcher Mountain greenway’s progress. Crown forwarded the inquiry to Simmons, who has so far not replied.